As designers, we can see the opportunities within the spaces which make up our community. That’s why we’re striving to engage the community in a collaborative way through prototyping public space and activating under-utilized areas. PARK-in-a-POD is an on-demand mobile community outreach platform that consists of easily-movable outdoor furniture stored in a Portable On-Demand Storage (PODS) unit. The POD is delivered to the site of a community event and then the furniture is arranged on-site to facilitate community engagement. Additional event-specific materials/resources are brought to the site to support community outreach, as required. After the event, the outdoor furniture is placed back into the POD and returned to storage. The Park-in-a-POD concept was created by the California Sierra Chapter of the American Society of Landscape Architects. The initial concept is based in Sacramento, California. Expansion plans are currently in development. Visibility: ASLA is constantly trying to improve awareness of the profession and the visibility of our events. 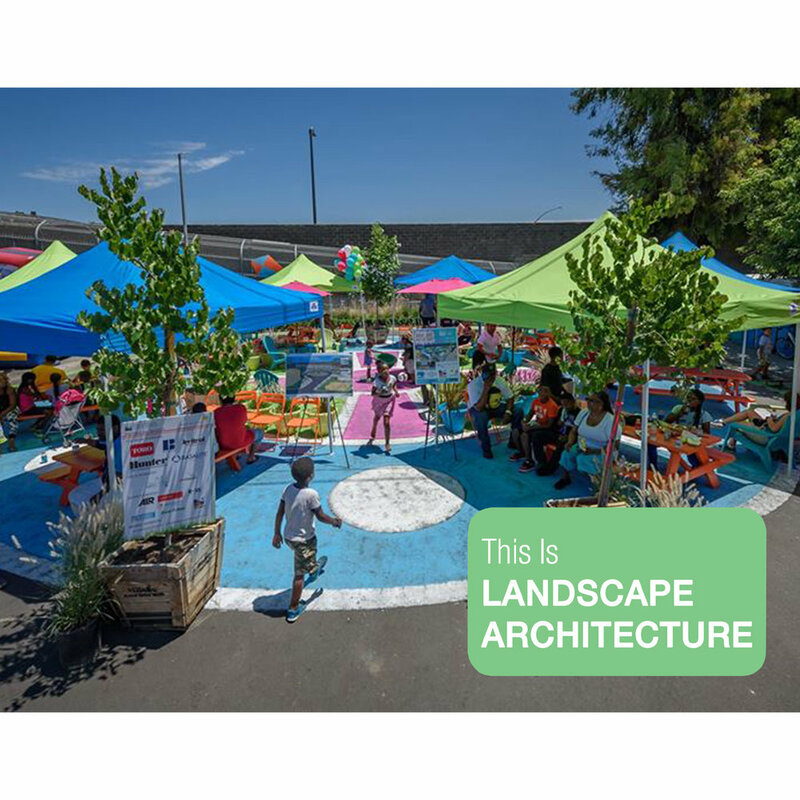 Park-in-a-POD provides a vibrant visual platform for our public awareness events and serves as a temporary ‘pop-up’ demonstration of landscape architecture design. Logistics: Materials storage, transportation, and venue capacity/location are challenges with planning any event. Park-in-a-POD combines flexible event capacity/location with simple storage/transportation. PODs takes care of storage, drop-off, and pick-up of the POD allowing our volunteers to spend more time focused on community outreach and awareness efforts. Volunteer Time: The Chapter relies solely on the valuable time of our volunteers for nearly all of our Chapter operations. Park-in-a-POD reduces the amount of volunteer time required to plan events by simplifying many time-consuming variables. Park-in-a-POD also seeks to increase volunteerism by providing frequent opportunities to volunteer in roles that are simple, visible, and rewarding. Follow Park-in-a-POD by following the CA Sierra ASLA Chapter Twitter and Instagram accounts!